Hello all! After all the difficulties we faced in our personal lives, it's finally here! 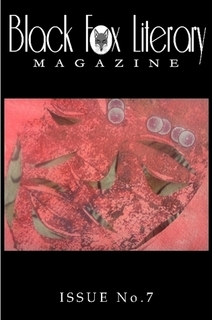 The Winter 2013 Issue of Black Fox Literary Magazine. We must first apologize for the delay and second, thank everyone for their patience. Be on the lookout for our contest announcement, coming soon! There are also a few things that we are especially seeking: Non-fiction, art and photography. We would also love any articles on the craft of writing and publishing. As always, you can read it for free on the Black Fox website or you can also show your support by purchasing a print copy or eBook. We couldn't do it without all of our loyal supporters. Thank you and we hope you enjoy the issue! Features work by: Colleen Fullin, Galina Trefil, Joe Giordano, Rebecca Dickinson, H. Lynette Barr, Michael Krizmanich, Angela Brown, Jeremy Bronaugh, Nina Hart, Sandra Windham, Amelia Nierenberg, Mariah Naylor, and Shellie Faught. Guest Article by Megan Orsini. Cover Artist: Rachel Carbonell.